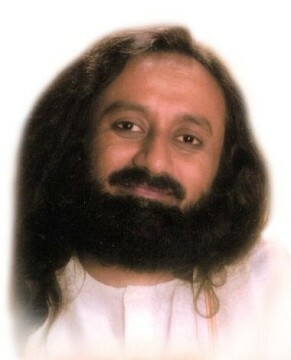 Gurudev, ages ago, continents and their cultures used to be one. What is the purpose of bringing all cultures together during the World Culture Festival? The continents are not going to come back together! The world’s culture need not become one. If it becomes one, it will be a big blunder! The world should be diverse. Just imagine, if the world has only one type of vegetable, only carrots or only potatoes, you won’t even touch them! Nature loves diversity; it has manifested itself in diverse forms, which should be protected. The diversity in nature must be protected. Culture is also one such gift of nature. Nature has provided us with multi-cultural things, whether it is food, music, language. Just imagine if all over the world, people spoke only one language, it would be so boring! If everybody looked alike, it would be so boring. We all look so different, from Mongolia to China to Japan to Australia, Argentina, Africa. And when the different cultures come together, to celebrate, it doesn’t have to become one. The World Culture Festival is all about celebrating the diversity, enhancing and honouring it. All the wars in the world that were fought were to make the world follow one culture or religion; at least in the Middle East, that was the issue. However, if you go to the Far East, it is a very different story. Go to Japan or India, there are so many different sects peacefully co-existing. The World Culture Festival is being held to send a message to the global leaders, global communities, that we are not just tolerating each other, but we are celebrating the diversity. I think tolerance has a very negative connotation; you don’t like something, you tolerate it. We only tolerate what is distasteful, which we don’t like. And tolerance is considered to be a very big thing! The World Culture Festival is not about tolerance at all! It is about honouring, celebrating, rejoicing different cultures of the world. Moreover, if we appreciate another culture, it does not mean that you are losing your own culture. If you appreciate the Chinese culture, it does not mean that you are losing the Indian culture. If you appreciate the Indian culture, it does not mean that you are losing the European culture. You are not losing something; you are only adding more glory. There are many beautiful things in different parts of the world, to honour, appreciate and make your own. Please talk about the subtle and unseen aspects of the World Culture Festival. There is a lot! Mysteries cannot be explained, they will just have to be lived! All I can say is that there are some very good things happening in the subtle, and that is going to benefit the planet. About 15-20 years ago, no government spoke about the environment; we spoke about it. The government only spoke about the economy; now that has changed. Few decades ago, nobody spoke about happiness, especially in the mainstream; it was considered weird. They would speak about economy and power. Today, Global Domestic Happiness (GDH) has become a part of the parameters used to assess the progress of a country; this is changing the consciousness. Around 2 billion people participated on World Yoga Day. A few decades ago, could you ever imagine that one-third of the world’s population would appreciate yoga? No! The older generation never thought that would happen! Of course, I knew! I can’t say I didn’t know; that would be wrong to say, but then it was something inconceivable. Gurudev, we just got back from Padayatra, it was an amazing experience. For the first time, I realised that I am able to pray for others. Is it possible that I can live like this wherever I go? Yes. You don’t need to neglect your needs and comforts, you can have them at the same time. 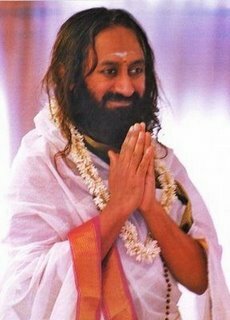 The purpose of the Padayatra is that your hearts open, you see how deeply you are connected with people you don’t even know! You don’t know their language, they don’t know your language, yet you feel that 'wow, we are so connected'. I have seen so many happy people here chasing you. I feel like I am the only one not connected to you. How do I know that I am connected to you? You don’t have to emulate what others do, run after my car; you don’t need to do that. You just be yourself. We are breathing the same air, we are connected with the same sun, standing on the same earth. And deep inside, we are all one, isn’t it? Can you claim this is your air or can I claim this is my air? No! My dear, we are all connected! Tell us a story, what was it like for you 35 years ago? What was your vision for the world then? 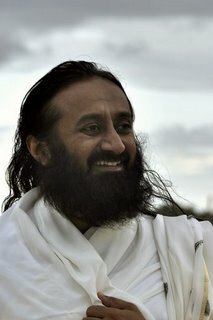 I used to think, "This ashram is going to be too small; there will be too many people here". At that time, there weren’t so many people here. They would all look at me and think, "What is Gurudev talking about, it is very strange!" We all have a responsibility towards the world, to share what we have. That is the only purpose of The Art of Living - to share, because we care. We care for the planet, we care for the people. Recently, an NGO went to the Tribunal in India, saying that The Art of Living are polluting the River Yamuna with so many people coming and holding such a big convocation at the river bank. I thought this was the biggest joke of the year. 'We’ are polluting the environment! Since it is the job of the Tribunal, they heard and then reprimanded them, "What were you doing all these days? When the stage is built, everything is done, and then you come to court?" Moreover, one can’t pollute that river anymore, it is almost dead. The river has maximum pollution because all the drains run there. No birds come in that area, there are no fishes in the water. The first day when we went to see the site, it smelt so bad, we had to cover our nose. One couldn’t even stand and breathe. As we started working, we got about 100,000 volunteer homes in Delhi to prepare enzymes. When we put those enzymes in the water, buffaloes started going in; earlier, no animal would even enter it. Today, the enzymes have cleared a lot of the odour, and the water is somewhat becoming alive again. We have not touched a single tree; we have not brought anything into that land, which was not already there. We just flattened it a little bit so everybody can sit. We have obtained all the necessary permissions; we have all the papers with us, validated correctly. We have not violated any laws nor have we polluted the place because there is no chance to pollute the river anymore! Pollution is already at the peak, it can only be reversed now, and that is what is happening. The beauty is, no Art of Living person is perturbed with this, everybody is happily doing their work, putting their 100%. Delhi is getting ready to receive the world. This is the way of the world. In individual life also, you wonder why is somebody opposing you? Haven’t you wondered what makes a very good friend of yours, someone very close to you, turn against you? It makes you wonder, what on earth made this person do what they are doing? In the same way, there are people whom you have not been of any big help or service, but they turn out to be your best friends! They come to help you out. Some unknown person comes to you and helps you when you are in need. There is a different law that works in the universe. When you know that, nothing can perturb you, nothing will make you unhappy, then you maintain that inner poise and joy.